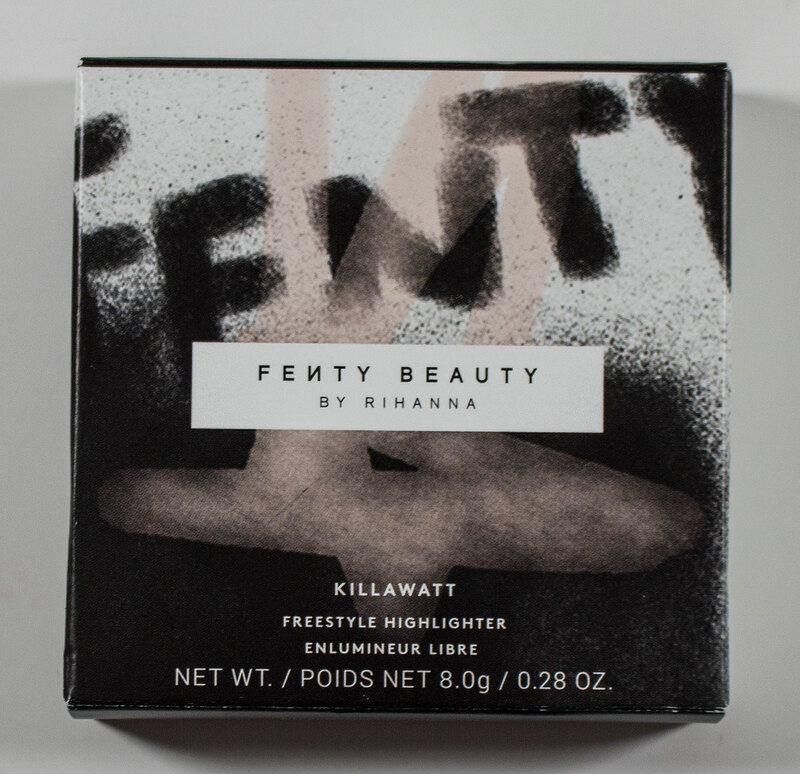 The Fenty Beauty by Rihanna Killawatt Freestyle Highlighter retail for $34US and $42CAN for 0.28 oz/ 8.0 g of product. 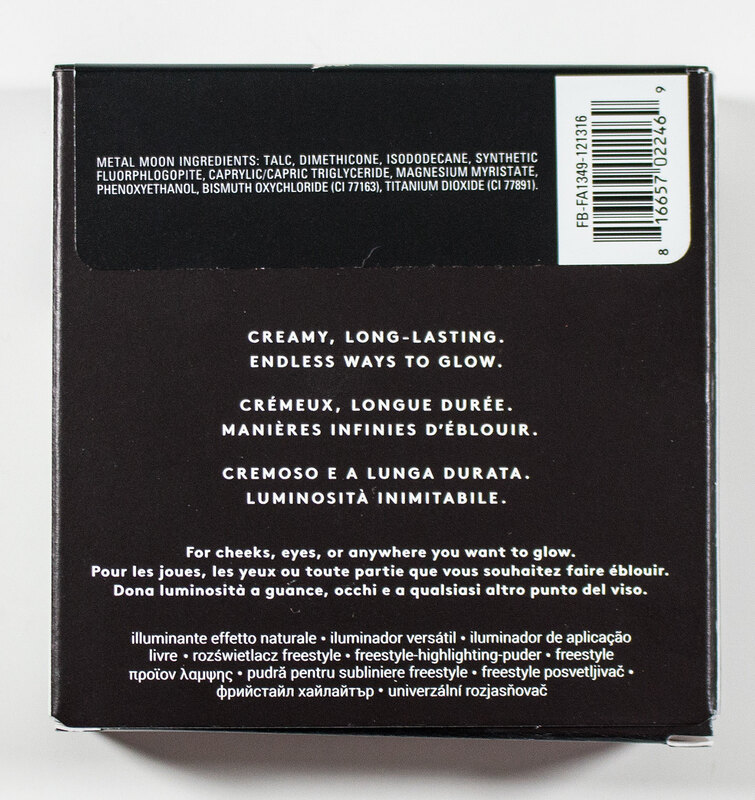 Fenty Beauty by Rihanna Killawatt Freestyle Highlighter in Metal Moon box art backside. 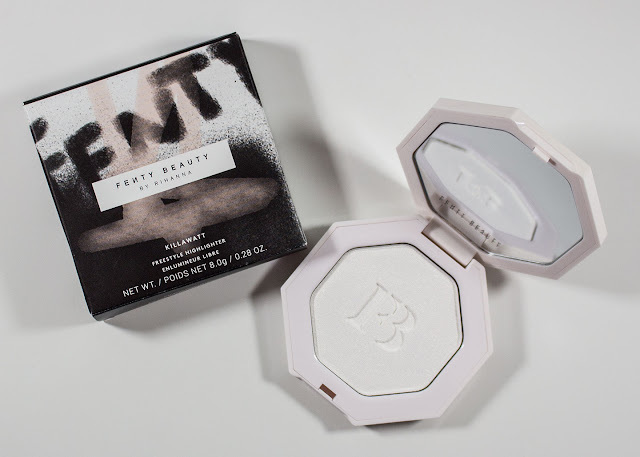 Fenty Beauty by Rihanna Killawatt Freestyle Highlighter in Metal Moon box art top. 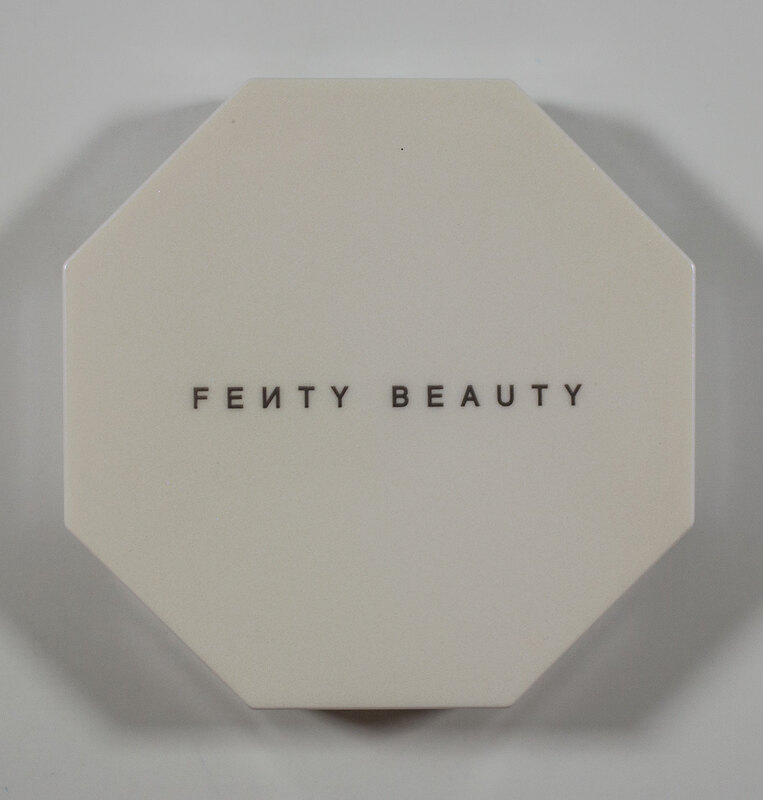 Fenty Beauty by Rihanna Killawatt Freestyle Highlighter in Metal Moon box art bottom. Fenty Beauty by Rihanna Killawatt Freestyle Highlighter in Metal Moon box art front. 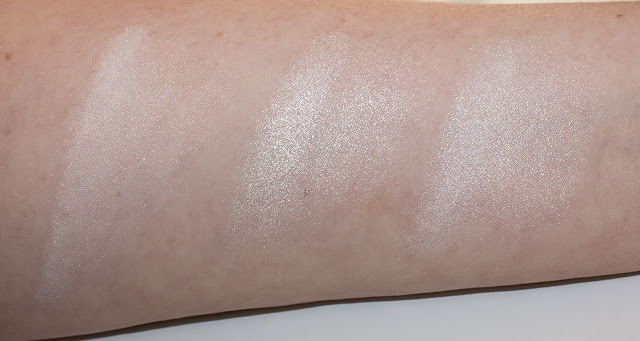 Fenty Beauty by Rihanna Killawatt Freestyle Highlighter in Metal Moon. Fenty Beauty by Rihanna Killawatt Freestyle Highlighter in Metal Moon compact lid. 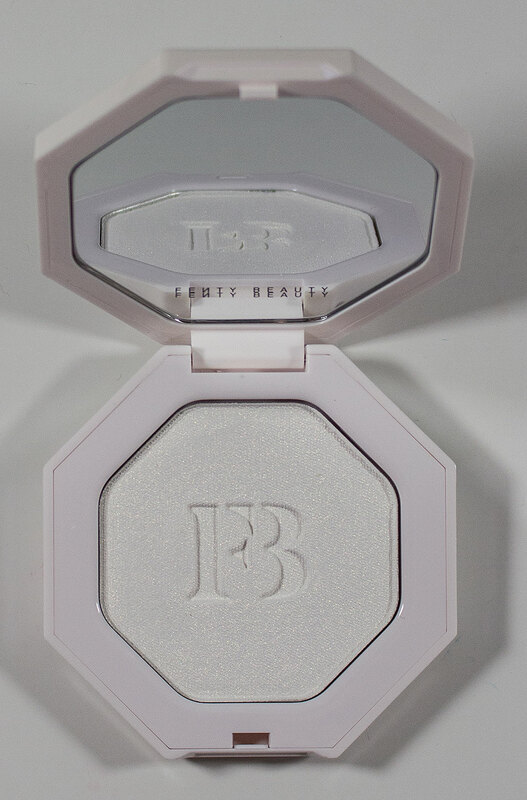 Fenty Beauty by Rihanna Killawatt Freestyle Highlighter in Metal Moon compact bottom. The Fenty Beauty Killawatt Freestyle Highlighter in Metal Moon is a smooth and creamy texture powder formula that is easy to sheer out of build up for the cheeks and eye. Hu$tla Baby is a brighter powder by comparison but this shade is bright than the soft powders in the split pan duos's the brand offers. Colour: Metal Moon is a soft white gold with a shimmer finish. 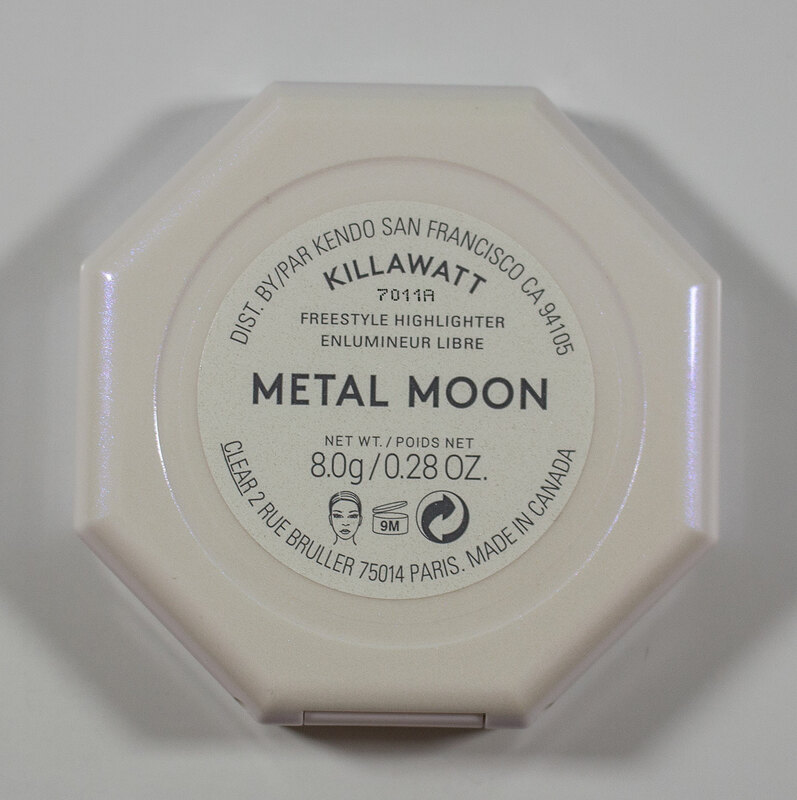 Wear: The Killawatt Freestyle Highlighter I get close to 12 hours of wear before slight fading on bare skin an much longer over foundation. The Fenty Beauty by Rihanna Killawatt Freestyle Highlighter compacts is white plastic mixed with blue translucent glitter. It has an octagonal shape and mirror inside the lid. Daylight & Flash Swatches. : Fenty Beauty by Rihanna Killawatt Freestyle Highlighter in Metal Moon, applied heavy and light. 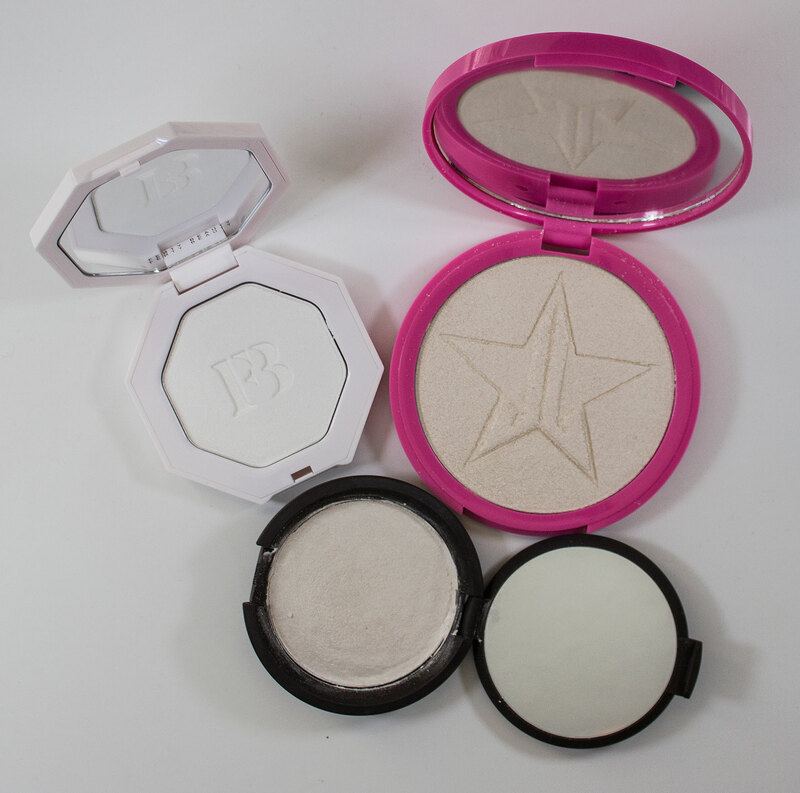 Fenty Beauty by Rihanna Killawatt Freestyle Highlighter in Metal Moon, VS Jeffree Star Skin Frost in Ice Cold, and BECCA Shimmering Skin Perfector Pressed in Pearl. 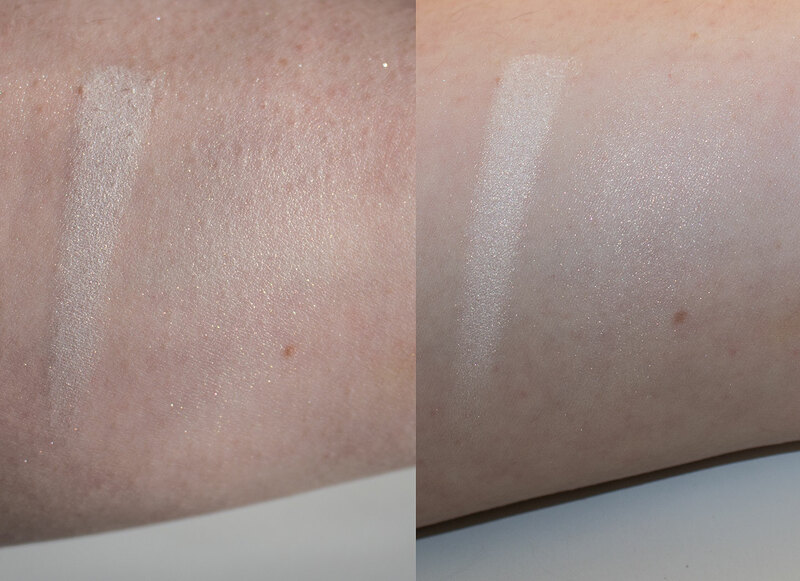 Daylight swatches: Fenty Beauty by Rihanna Killawatt Freestyle Highlighter in Metal Moon, VS Jeffree Star Skin Frost in Ice Cold, and BECCA Shimmering Skin Perfector Pressed in Pearl. Applied heavy and light. Flash swatches: Fenty Beauty by Rihanna Killawatt Freestyle Highlighter in Metal Moon, VS Jeffree Star Skin Frost in Ice Cold, and BECCA Shimmering Skin Perfector Pressed in Pearl. Applied heavy and light. 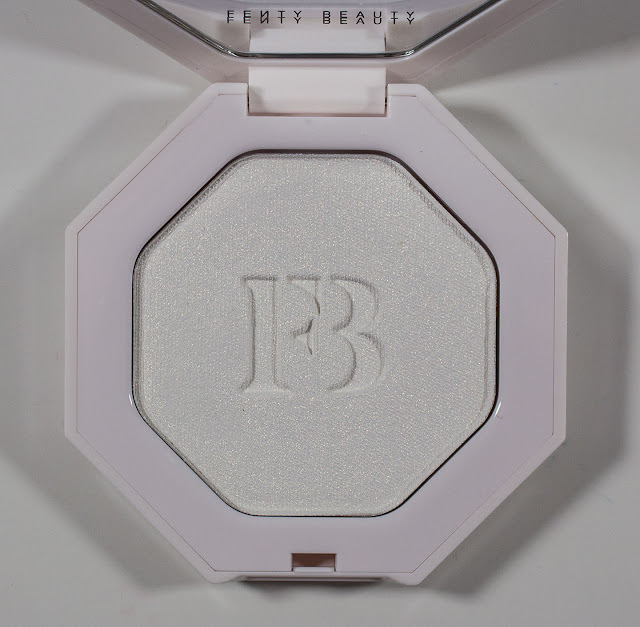 The Fenty Beauty by Rihanna Killawatt Freestyle Highlighter in Metal Moon is a softer powder looking powder compared to Jeffree Star Skin Frost in Ice Cold is very frosty and the BECCA Shimmering Skin Perfector Pressed in Pearl is a bit more shimmery. 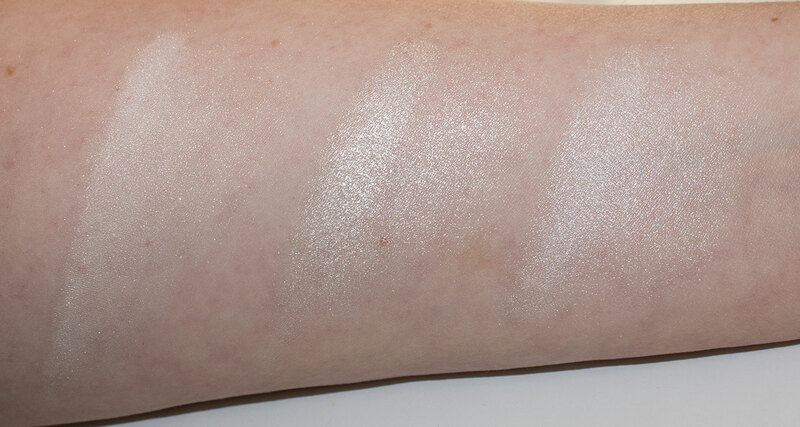 I really like the formula od the Fenty Beauty by Rihanna Killawatt Freestyle Highlighter but Metal Moon is the only what that really works on fair skin tone without mixing in another colour like Hu$tla Baby but that one is worth mixing and the shades Lightning Dust/Fire Crystal sort of blended too much into my skin tone. It is a subtlier finish compared to my other white highlighters so it's up to you to pick which finish you want. But I like all of them personally depending on what I need for my makeup that day.